DieboldDirect.com is the official OEM provider of drive-up VAT carrier tubes for Diebold, Incorporated. With a wide variety of bank teller products for your drive-up window, night drop and VAT system, DieboldDirect is your one-stop source for teller supplies. 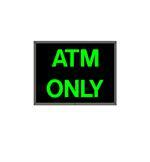 Your customer or member is assured the best experience with DieboldDirect.com ATM Drive-Up supplies. Whether clarity of hearing through teller headsets or ease of ATM location with our signs and lights, you’ll be sure to make for a repeat visitor. Contact us if you would like to request assistance in choosing the best bank teller supplies for your financial institution.